Artificial intelligence is moving into customer service. Many service organizations already use AI and even more plan to use it in the future. The growth of AI use over the next 18 months is projected at 143%, according to a new study. The third annual “State of Service” study comprised a survey of 3,500 customer service agents and decision makers in North America, Latin America, Asia Pacific and Europe conducted by Salesforce Research. While about a quarter (24%) of service organizations already use AI, more than a third (34%) plan to within 18 months. There are reasons behind the move to AI. Most (70%) customer service agents believe automating routine tasks would allow them to focus on higher-value work, according to the study. 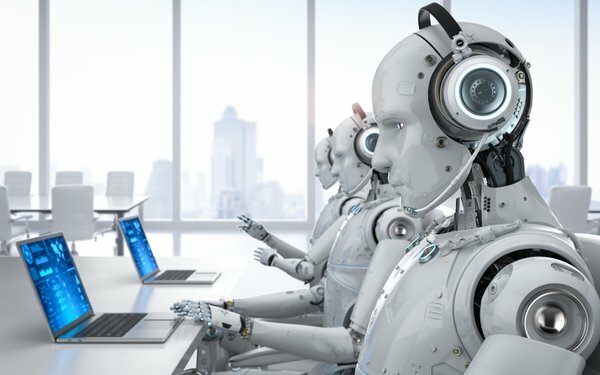 Customer service agents use AI in a number of ways, including gathering basic information (81%), to automate the handling of routine customer issues (75%), case classification and routing (74%), providing management with operations insights (71%) and pre-fill fields in the agent console (71%). The majority (51%) of customer service agents without AI spend their time on mundane tasks, compared to 34% of agents with AI. The use of chatbots -- the AI technology that simulates voice or text-based conversations -- are projected to grow 136% over the next 18 months, from 23% of customer service agents using them now and 31% more within that time period. The most common use is for simple self-service scenarios (78%), followed by gathering information before handing a case off to a human agent (77%), providing agents with guidance as they handle cases (71%) and greeting customers when they call (67%). Whether they like them are not, customers are going to be dealing with more chatbots, with the hope that AI will become good enough to know what they want and quickly figure a way to provide it. 7 comments about "AI Moving Into Customer Service". Donald Frazier from OneVideo Technology, March 19, 2019 at 9:25 a.m. Suggestion: each chatbot service posts a rating on a 10-point scale for the percentage of inquiries it resolves, and each one tells you when you have exhausted its range of capabilities, and when human backup is not available. We don't expect perfect. But we do expect a far better idea when deciding to plunge into this time sink, of whether it can work out. Some of these systems are programmed for only a narrow range of responses, have no knowledge of the customer and the engagement, but will keep you waiting for hours if you let them for a transfer that will never come. This can be right up front, in an on-screen rating. No rating, no business. Edward Mcgraw from Salesforce replied, March 19, 2019 at 11:30 a.m. I like these suggestions Donald. Seems like the larger point you're making is around transparency, and I completely agree. Bots need to immediately identify themselves as such otherwise companies risk a frustrating experience. There also needs to be a mechanism in place through which the bot is smart enough to know when it's out of its depth, and can then immediately hand off the interaction to a human agent. Understanding when and in what cases that handoff should take place is massively important. John Grono from GAP Research, March 19, 2019 at 7:26 p.m. I might develop a 'Customer Service Bot Response Bot'. I set up a new 'phone number that my Bot answers. The number is only shared with businesses that use 'customer service bots'. I then delay my payment to the business. When someone from Accouns Payable starts to call me for payment, the 'Customerr Service-Bot Response-Bot' answers the call and immediately puts them on hold for around 10 minutes as their call is important to me . The bot then transfers the incoming call to 'someone who can help you', but is in fact back to the same bot. The piece de resistance is that the bot has a 'frustration meter' coded into it, and when it hits 7 on a 10 point scale, the bot keeps asking the person to repeat what they said as 'the line is bad and I can't hear you clearly'. When the bot detects that the caller has gone into 'Payment Demand Mode', the bot responds mid-sentence and hangs up on itself. It is then coded to respond with any immediate call-backs from that number with an engaged signal. Chuck Martin from Chuck Martin replied, March 19, 2019 at 7:38 p.m.
That would be a best-seller, John. Chuck Martin from Chuck Martin replied, March 19, 2019 at 7:40 p.m.
Great points, Donald. Reminds of the bot that goes through all the programmed series of questions and says you need to speak with an agent. Then the next bot issue the killer pharase: "Your wait time is 47 minutes." Walter Sabo from SABO media, March 21, 2019 at 6:25 a.m. When I contact customer service handled by humans it is always a horrible experience. When I get a 100% automated system it is insanely slow and usually results in the need for a human. "This is a terrible idea. Chuck Martin from Chuck Martin replied, March 21, 2019 at 10:10 a.m. Sounds like lose-lose proposition, Walter.